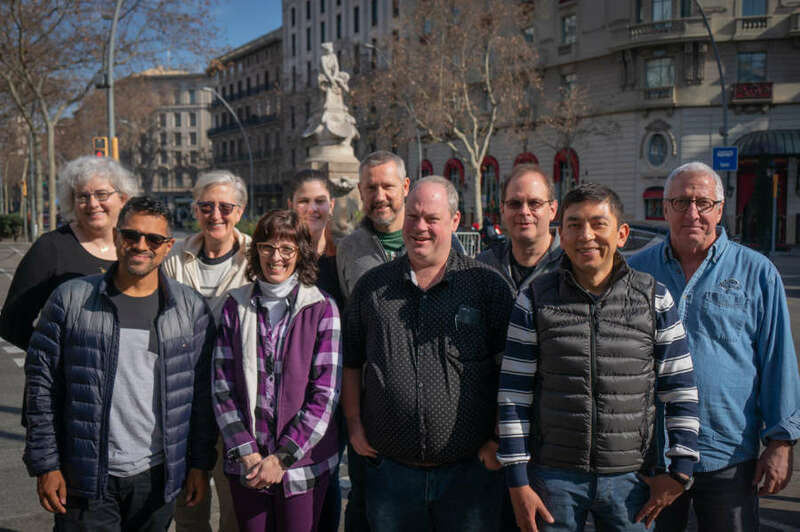 This photo was taken during a meeting of the board in February, 2019 in Barcelona, Spain. Left to right: Ellen Grove, Victor Hugo Germano, Heidi Musser, Becky Hartman, Tricia Broderick, Paul Hammond, Craig Smith, Brian Button, Juan Banda, Phil Brock. Paul is a 20+ year veteran of the software industry, and an 10+ year convert to Agile principles and practices for delivering software. He heads eBay's European Product Development team. Before this, he spent 15 years at Microsoft in the MSN and Skype product teams. A senior engineering leader, Paul's passion is growing and leading large geographically dispersed Agile development teams. Together, Paul and his teams have shipped large-scale Web, mobile, and communications products that are enjoyed by hundreds of millions of users worldwide. He also spearheaded Agile adoption and long-term transformation of both his own and other product teams within Microsoft, and has coached and mentored colleagues and teams at other external organizations. Paul has been involved with the Agile20XX Conference since 2007 and had the privilege of being the Agile2015 Conference Chair. He lives near London, England, and relaxes by being a geek, watching the Red Sox, taking photos, playing musical instruments of various types, and hanging out with his family. Victor is a Brazilian entrepreneur, working with Agile since 2004. From coding dojos in Brazil, back in 2005, to running his own company, he has been working with Agile teams and helping the Brazilian community grow from small user groups to national conferences with more than 1000 participants. Today, as an Agile coach, Victor helps teams and companies leverage of Agile processes and values to better deliver products. He is also on the frontline of selling Agile projects, which has gave him insights about how to build contracts to support this different way of working. Victor is a co-founder of Lambda3. The company's vision is to improve the software development discipline wherever they act, sharing their vision of quality and care for the profession. It aspires to create an organization where participation, responsibility, and transparency are keys to success, and a democratic workplace where everyone thrives. Craig Smith, Agile Coach and Director at Unbound DNA, has been active in the IT industry for over 20 years and has been an Agile practitioner, coach, and trainer for over 10 years. Craig helps organize the Agile Brisbane Meetup Group is the director of YOW! Conferences. He has presented at numerous Australian and international conferences, is an Agile editor for InfoQ, and co-hosts a podcast called "The Agile Revolution". Phil’s background includes nearly 20 years in the software industry. He managed operations at Instantiations, a software tool and consulting company, from 1997 to 2001. He subsequently worked for five years as an independent small business consultant. Phil has been with Agile Alliance since 2006 and assumed the role of managing director in 2008. During his tenure, the organization has grown exponentially and now has more than 60,000 members and subscribers worldwide. Ellen is an Agile coach, trainer, and organizational change agent with Agile Partnership. Based in Ottawa Canada, she works with organizations of all sizes around the globe to help them put Agile thinking and being into action. Open Space and LEGO SERIOUS PLAY are Ellen's favorite facilitation approaches for getting people to talk with each other about the things that matter so that they can do great work together. She is a serial organizer of Agile events locally and internationally, and she presents frequently at Agile conferences in Canada and abroad sharing ways to use playful approaches to do serious work. Juan is a trainer, coach, speaker, blogger, martial artist, and out-of-the-box thinker. He was exposed to Scrum in early 2007 and committed himself to continue learning and applying Scrum in the teams and organizations where he worked. His path put him in the roles of Scrum Master, Agile Trainer, Product Owner, and Agile Coach. Juan now holds all of the requirements of the Scrum Alliance and is a Certified Scrum Trainer (CST) in addition to the PMP ™ & PMI-ACP certifications he has through Project Management Institute (PMI). After earning his Master’s degree in Management Information Systems from The University of Illinois at Chicago, Juan worked as a full time professor, consultant, developer and manager. During his tenure with the University, he led teams of more than fifty developers and also served as the Head of the Engineering Department. Juan is also a community enthusiast and dedicated to the Scrum movement in his home country of Bolivia. He has organized Scrum Bolivia Day 2012, Scrum Bolivia Day 2013, and the Regional Scrum Gathering Bolivia 2014. In August 2013 Juan was elected to serve as a member of the Agile Alliance Board of Directors. Brian Button is the Senior Director - Agile Transformation Office for Express Scripts, where he is responsible for the Agile journey of the entire organization. Tricia has more than twenty years of experience in software development and is passionately focused on facilitating high-performance software development environments, Her leadership, training, and coaching at all levels of an organization helped lay the groundwork to shift teams from one-year product cycles to feasible, daily delivery of high-quality software and services. Tricia openly shares stories and examples from her firsthand experience to inspire people to reach new heights through continuous reflection and growth. As a coach in the Agile For All team, she is dedicated to making a difference in the workplace. She is an exceptional leader, coach, mentor, facilitator, trainer, and popular speaker at national conferences. Becky is an enthusiastic and passionate agile coach, trainer, facilitator, and published author with nearly twenty years of combined experience in both traditional methodologies and agile approaches with applied experience in a variety of domains. She holds several certifications in Agile and Project Management, including PMI-ACP, PMP, CSM, CSPO, CSP, PSM I and II. Becky is also known for her active volunteering in the Agile community at Agile Alliance conferences, Tampa Bay Agile Meet-ups, and as a co-author on The Agile Practice Guide. She inspires and ignites teams’ passion for their work through active engagement and support as they transform the way they view and execute work. Becky is currently a Senior Agile Coach at AgileThought in beautiful Tampa, Florida. As a senior Executive, I have spent over 30 years leading and advising businesses on designing new operating & engagement models to drive digital transformation and achieve enterprise agility. My passion is 'managing the soft side of technology'© – through the adoption of fundamentally different ways of working, thinking and being. A courageous leader and change agent, my Agile experience spans multiple decades and multiple industries. An active member of the Agile community, I am a co-creator of the Alliance’s Agile pilot Webinar Series on Business Agility and presented ‘The Agile Mindset and Enterprise Agility’ in May. I have been a member of Agile Alliance’s Supporting Agile Adoption Program since 2014. Additionally, I Co-Chaired Agile Alliance's Agile Executive Forum in 2013 and 2014. Today, I advise organizations on embracing the Agile mindset and Agile core principles to achieve enterprise Agility.